Working in porcelain or white stoneware, Glenn generally begins the creative process by making the forms on the potters' wheel and then alters and combines pieces. Glenn alters his forms by paddling, piercing, beading, and carving - the finished pieces generally have hints of naure: leaves, gourds, and flowers. The patterns created with the beading found on many of his pieces are influenced in part by his exposure to the Amish community as a child where he learned to crochet and appreciate the fine stitching patterns found in the Amish quilts. While Keith's primary function is managing the business aspects of Pottery Boys Clay Studios, he also contributes to the productions side by mixing glazes, preparing bisque for glazing, loading kilns, and creating functional slab pieces, once made, he glazes them with a food and microwave oven safe glaze. Keith says, "My business degree and my experience in retail management keeps us on track business-wise but I am also enjoying the process of learning the more creative aspects of our business." Glenn Woods shown above putting the finishing touches on a large flower top vase - adding the beads, which will later be colored to emphasize the patterns. 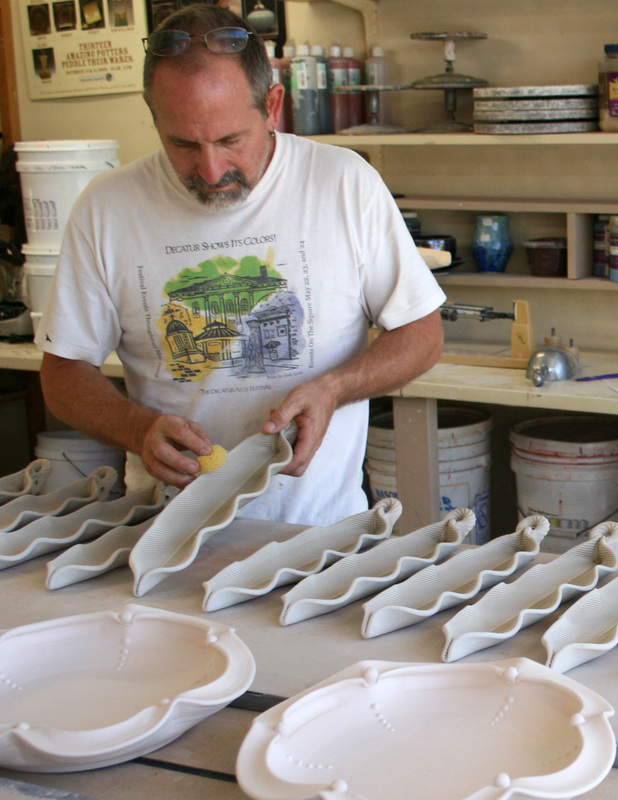 Keith Herbrand shown above creating some of the functional serving trays that also may be used as decorative wall pieces.